Learning to cook? Did I think it was absolutely necessary? No! Having recently emerged into the world of work from four years of writing essays in my pyjamas, delaying doing my laundry until I got down to that last pair of bikini bottoms, and dancing like a loon into the ungodly hours of the morning I will be the first to admit how easy it is succumb to the good old excuse of “I don’t have enough time or money” when your Mum raises that classically irritating question of whether you’ve been cooking healthily. But looking back from the other side as a supposedly well-educated 24 year old, I warn you without any hint of maternal nagging to act now before it is too late. Yes you heard me...it is no lie that your university years are some of the most formative of your life, so unless you want to be stuck eating pasta and pesto into your adult life it is time to shed those excuses, roll up your sleeves and step into the kitchen. With around a month to go until the new university term starts, there is really no time like the present. Seize the day, get cooking and by the time you find yourself back in the land of iPlayer marathons and caffeine-fuelled all-nighters in the library you may even be proficient enough to cook a game-changing meal for that girl you’ve had your eye on, or astound your housemates and earn yourself an accolade along the lines of ‘That’s Katy, she can actually cook, I mean like she knows how to use the oven and everything’. Aside from your social status, there are of course some other minor benefits to mastering a few simple recipes made from fresh ingredients. Using actual fruits and vegetables, rather than consuming just the odd dollop of tomato ketchup or swig of orange juice, will do wonders for your health. Not only keeping common university ailments such as freshers’ flu and pimples at bay, the vitamins and minerals in these colourful food groups along with a decent intake of protein and complex carbohydrates will also help you to feel more energetic and fuel your brain for those all important assignments...ahem...after all that is why you’re at university, right? So, now that I’ve surely convinced you that arriving back at university with some simple but exceedingly delicious meals under your belt is far more satisfying and socially alluring than even the most glowing of summer tans, it's time to get stuck into the cooking! Over the coming weeks I will be blogging my top ten student recipes, all simple, delicious and made using easily available and cheap ingredients. Recipe number one, Pork Sausages with Onion Gravy & Best-ever Mash is out now, try it whilst it's hot! 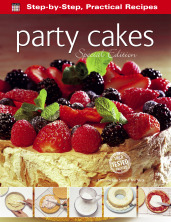 Download a digital Recipe book, a special edition Party Cakes. With over 20 years of quick and easy recipes FLAME TREE has thousands of dishes for the beginner and the enthusiastic!